This can happen when you haven't set the signature for the client ID in your API console project, or if you copied the wrong key value from keytool. Doing so is documented in the steps of the quick start guide on steps 7, 8, 9, and 10. I have this problem and even after creating 10 different client IDs with different SHA and package name, it doesn't work... until I found out that you have to fill the Consent screen. The consent screen will be shown to users whenever you request access to their private data using your client ID. I've solved problem by removing .setScopes("PLUS_LOGIN") in the PlusClient.Builder. Assuming you made a mistake configuring the negotiation between your android app and the Android API server granting you access. Most likely caused by you not adding the correct package name or correct SHA1 fingerprint. I followed these steps to blow out the wrong configuration and do it right. Click the button: "Create another client ID". Choose: "Installed Application" radio button. a. Use the command keytool -list -v -keystore /home/el/.android/debug.keystore. Enter password, If you never set it, the default password is 'android'. b. The SHA1 fingerprint is shown on screen, copy that. Paste the above value into the "Signing certificate fingerprint (SHA1):" box. Click the button: "Create client ID". Run your android application again, click "Sign in". 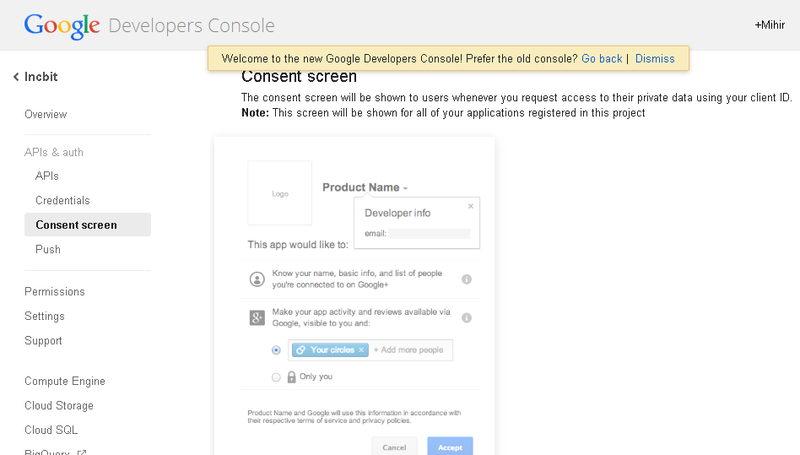 Now you are presented with an Activity to "Sign in to Google+ SDK with Google". In my case, the solution was to actually set an email address in the Consent Screen. First, I was a bit reluctant to select my personal address and for an strange reason you can save the form without this piece of data with no error. After checking what others have suggested, as soon as I set my email address in that form, it started working. I have been searching how to fix this for a day with full of research without luck finally i managed to resolve this issue with the following approach. Now this bug as i noticed (at least for me) was that in my cloud console, the project i have created was long ago with the old interface and few months ago i migrated to the new GUI.Once you get the new look on cloud console you will notice that new projects have an auto generated project id like this atlantean-ares-331 while old projects got a long integer value as project id which is not visible. So if your project was created with the old GUI and you have just created new client id for OAuth for that project you will get the Toast "An internal error occurred” while trying to sign in with google. Ensure that none of your projects has the same package name on OAuth Client ID with the one you will use now otherwise you will get Error This client ID is globally unique and is already in use. (you will have to delete the old OAuth client id with the same package name you will use now). Go to Credentials Create New Client ID for OAuth. My solution to the problem was following. I did everything others recommended and there was no typo regarding the package name and SHA1 key. I also tried removing the key and then adding it again but it didn't help. What did help is removing the key and creating a new project (at https://code.google.com/apis/console) and then creating the Client ID (with package+sha1) again there. After that (5 secs) everything worked on my Android device. This problem is related to the permissions from the api console. if you are using a permission related with SCOPE_PLUS_LOGIN, in the api console you must create two keys, one for OAuth client id, and other for public api key. In my case the problem was that I changed the package name of the app and didn't update in dev console. For me it was that i was attempting to use my production key when installing it using my debug key. Make sure your using the right SHA1 from the right keystore. I turned around to the Google IO 2013, and changed the initialization of PlusClient, then it works. Thanks Thano for the solution "Now this bug as i noticed (at least for me) was that in my cloud console, the project i have created was long ago with the old interface and few months ago i migrated to the new GUI.Once you get the new look on cloud console you will notice that new projects have an auto generated project id like this atlantean-ares-331 while old projects got a long integer value as project id which is not visible. So if your project was created with the old GUI and you have just created new client id for OAuth for that project you will get the Toast "An internal error occurred” while trying to sign in with google." For any reason my project did not have a project ID (old console/new console?). As Thano (above) suggested, I created a brand new project, created Client IDs, ... and then in worked. Thanks for the advice!! Remember to use the built-in debug keystore for testing. I had everything else working correctly, but I had set my production keystore SHA1 fingerprint in the Credentials in the Developers Console, which caused it not to work. If your facing this error when you try to run the sample application "or" copy the project which you have created in other machine which was running successfully in that and giving such pop-up error in the other machine where you are trying to run ,you can follow the below method and it will help. 1.Generate the new SHA1 if you copy your project and run it on other machine for the package name and path provided for keystore. 2.Change the ClientId in developers console for new generated SHA1 and run it in the new machine where you have copied the project and trying to run it. Something often overlooked is the package name. I'd like to clarify the step 6 by Eric Leschinski above (can't comment there): the required package is not the package of an activity, rather the package of your app's manifest. I had the same issue when I used SHA1 for debug.keystore for debuging then exported my application forgetting to generate SHA1 for keystore that I used to export my application. Its working for me when i connect the device and install the apk from Android Studio. But its now working for me when i generate the .apk and install it from dropbox. I went through all the answers provided here and others as well. In my case the issue was the SHA-1 as well. The reason I was getting the incorrect SHA-1 was my keytool export cert command. The problem was in the androiddebugkey variable. Here you have to give the name of the key you use for signing the application. To add to this long list of reasons my problem was that i got the debugkey from the jks file rather than the app. Not the answer you're looking for? Browse other questions tagged android google-plus or ask your own question. Google Plus sign in Android?